Now the video is pretty clear and a case of assault should be filed against the lady at CCD. 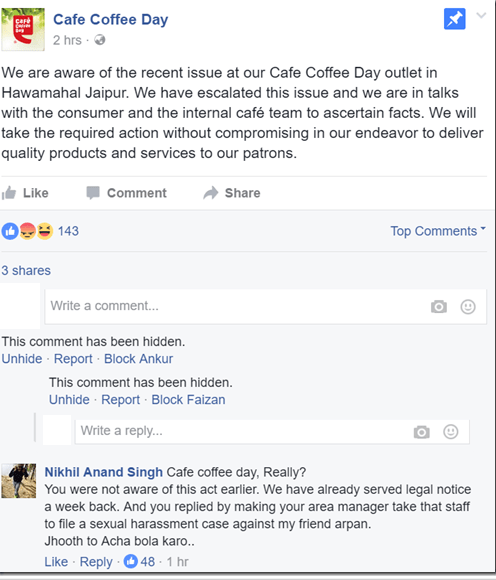 However in a disgusting turn of events, we were informed that a case has been filed by the lady from CCD against the customer for harassment. We all know how skewed laws are in India against men and one can very much imagine that this lady also is trying to use laws meant for protecting women to get out of this mess. In the meantime #CockroachCoffeeDay is the hashtag we want to trend. Meanwhile CCD has put up a notice on its official facebook and twitter channels promising an investigation but no apologies. As you can see from some of the comments on these posts, CCD seems to have acted in malice when the issue was first reported to them. It could also have been a tactic to prevent the customer from releasing the video to the media. CCD has released a statement that it has ‘suspended’ the said employee. The statement still does not apologize for the behavior of the staff or the cockroaches. Also does not address the fake complaint by the staff. “The lady team member referred here hails from rural Orissa and is part of the programme run by NGO Gram Tarang to uplift weaker sections of society and girl child specially. She underwent rigorous training on joining us to become a team member and was posted in Jaipur. As per lady team member, she had objected to her video being taken by the customer and her repeated requests were also not heard, thus invading her privacy. Till the time thorough investigation is being done, lady team member has been kept off duty,” it said. Vigorous training does not seem to have helped here. Although its a noble cause, corporations need to be careful about who they hire for people facing roles. In this case the NGO as well as the company seem to have made a mistake hiring someone who appears to be mentally unstable into a job that often requires you to be extremely calm in difficult situations. Ironically the NGO Gram Tarang lists Cafe Coffee Day as a success story of its employment training practices. Hopefully this was just an aberration and the NGO is able to revisit their training and practices to ensure it doesn’t happen in the future. As for CCD, I don’t really have a lot of sympathy for them given their extreme reluctance to admit fault in the matter and their attempt to use the legal framework to cheat and deceive the customer.